One afternoon in June 1980, while on holiday in Egypt, I entered the Kings Chamber of the Pyramid of Giza in Cairo and had an overwhelming deja vu. I thought, ‘I’ve been in here before and furthermore I’m still in here now– as an Atlantean scientist!’ Then the scene changed and this world was overridden for some seconds and interspersed with another one where I was standing as my present self, inside the chamber and surrounded with all this Atlantean technology. It was wall to wall from the top to the bottom with small lights and machines with dials. There were a few men standing there who were also from Atlantis and they were scientists. I remember seeing the present ‘reality’, which appeared on top of the Atlantean background recede into the four walls. After a few moments it returned and the present reality solidified again–the gasses of the air rearranging themselves as before. I’m sure wall magnets withdrew a layer of the reality of that hour in 1980 into a sort of ‘freeze frame’ and held it in some holding area, putting that moment of time into another form. Time was bent into four loops within a sectioned off area of space. Lasers embedded in the four corners of the room sliced a cross into the ethers, up to a central circle which was cut out of the centre, about three feet across. The alteration of time was only manipulated in the cut out four sections leaving the centre in which I stood completely untouched. This ensured my ‘timeline’ wasn’t broken apparently. A similarity is found in a mini vortex, where a person once walked across a field and then vanished, and he was heard yelling from a distance.”I can’t find the opening to get back”. He was never seen again, because he went into the next dimension through a thin section of the veil. There are stories of this happening in early Ireland, however some returned but to a few years later. But it seemed to them to be only hours. However, in my case a vortex was created around me which left me as is and intact, while the time also apparently operated concurrently as Atlantean time. This enabled people to move through time and into the next dimension to operate in the time tunnel I was in, as they wished. I was magically transported back to appear in their Atlantis, but apparently never physically left the present. For a moment my world was taken from me, but it was my immediate surroundings that were transported back in time. The Atlanteans only removed the most dense (chemical) ether representation of that which we term physical ‘reality’. The scene was still existing, slightly missing some earthly density. The 4 ethers (i.e. chemical, life, light and reflecting) were deliberately separated and split away, to remove a part of physical reality, leaving mainly the parallel universe (comprising the other 3 ethers: life, light and reflecting) in a secondary time portal, surrounding the 3 feet one I stood in. The lowest (most dense) ether, the chemical ether was temporarily removed. When the Atlantean scientists were finished, they then restored it. However I don’t think this could be done with the other ethers. If you think of this physical world as being made of solids, liquids and gases – the ethers comprise the bits we can’t see that are too fine to be visible. These are the bits the Atlanteans manipulated. I know the Atlanteans used magnets to draw away the minerals in the chemical ether and some sort of possible electromagnetic wave flattening machine. I think each increase in time is measurable by the energy generated. Each century refined down to the day and hour has a particular ring. This is determined by the planetary positions in relation to each other which apparently produce specific types of energy which can be measured. The Atlanteans were expert time travellers. I realized that I was experiencing my Atlantean life again by standing in a time tunnel of my own making. I was in the presence of myself along with other scientists who were all projecting forwards to enhance themselves mentally in the future. The Atlanteans (who had multiple ways of seeing the future) saw terrible things happening and wanted to help, knowing that ordinary scientists didn’t understand what covert present day hyperdimensional physicists in partnership with extra-terrestrials are now doing to our future reality using sciences which are unknown to the public. The Atlanteans believed their technology would help save the future, by enabling themselves in incarnation at that time to understand technically what dark forces were doing to the planet’s natural timelines. However, I don’t know what all the other scientists, in the rest of Atlantis, used when they also projected to their future, which is our present, using all sorts of different kinds of time machines and occult techniques. We, in the pyramid were only one group of people changing the future. Others did the same from different places and times, again using ET given technology. Many of the Atlanteans used hypnotism, remote viewing, trance mediums, magic mirrors, spaceships that could manipulate time and space, plus opening up timeportals and wormholes. But there were a few others in Atlantis with me in the Kings Chamber also transporting themselves forward in time in the same way and I remember one who is presently a pyramidologist. Another is a time travel expert. The time machine in the pyramid still exists but others had tuned it for other times and dates, depending on what lives they reached forward to. Many of them had multiple lives as scientists in the last 300 years of our time, and they helped themselves invent many things to quickly hasten knowledge to avoid the coming destruction of the world’s natural timelines. These will change during planetary alignments which open vortices across the universe to earth. Aliens are manipulating our time lines, and in order for us to understand we must know how they are doing it. We did this in Atlantis too, so we just need to remember the processes at work. (The Philadelphia Experiment started an interest in time travel again). If I wanted to, I could go back to that moment and add to the activities, by projecting backward in time mentally. I have done so many times and talked ‘live’ with myself as the Atlantean scientist, who waited until the effects of his changes took place in my present body, then expected me to be on his level to enable a conversation between us about the future. He claims his name is Ahern. I have felt Ahern, (the Atlantean me’s) presence trying to tap into my mind for 20 years but I haven’t allowed him into my consciousness to ‘take over’ my body as he would like and be a ‘walk-in’ because I prefer to be in charge of myself. I know he would like to just step into me and ‘live’ in the future and be where all the action is at the beginning of the millennium, but I can’t allow it. I would be happy to bond with him in a way if I could trust him in my heart but as he was completely unemotional, he is unable to do this. I would prefer he was more balanced with head and heart before he shares my consciousness. He is a cold curious type, who seeks perfection. Being a woman, I have other areas of life I enjoy and also don’t want to be sidetracked from my present destiny, which is more religious, mystical and news orientated. I guess he is like an alternate personality which is attracted to science, only I have tracked his origin. Though I know he is waiting patiently until I reason with myself, that I need to know all he knows to write it all down in a book. I feel he is seeing my side as well, that he needs to be a bit softer. Others in the Kings Chamber with me, doing a trip to the future from Atlantis, picked different days to claim as ‘theirs’ when they also projected into themselves arriving in the Kings Chamber in the future. (strangely two women have mentioned that when they went into the King’s Chamber in pyramid they were taken over by aliens. One is Barbara Marciniak and another person called Elan O’Brien was interviewed by Tim Beckley, so presumably Ets know to manipulate the King’s Chamber as a place to give people psychic power. By only removing the time around me this enabled me (Ahern the scientist) to do tests on my brain and DNA etc. while still in Atlantis. Thus Ahern could step within my time line, but if I stepped out of the circle, I could have come to harm. Although it felt like ‘I’ was there too I wasn’t physically – only mentally and emotionally. Ahern then shone a bright light around my head to see which ancestors were dominating my genes. After seeing that Atlantean scientists in my forebears weren’t there Ahern prepared to move ancestors in to those sections of the brain ‘they should be’. It would appear that each section of the brain carries the activity of the ancestors which used it, and can be read visually i.e. pictures of their bodies show. I guess like one of those ‘read your aura’ cameras, but this light was so bright it showed the inner planes as if it were daylight. I don’t know what kind of light it was exactly but it had a cold white energy – it wasn’t a flame I think it was a special crystal tuned to a pitch which enabled this. Ahern moved the ancestors he didn’t want out of the present position in my brain and put in the ones he wanted. Each ancestor was visible as a face above the head, each one lined up behind the other chronologically. I saw ‘myself’ – (as Ahern the Atlantean) walk towards me and stand in my body. I appeared then about six feet tall, with reddish/light brown shoulder length hair, green eyes, freckles and slim build. I was wearing some sort of pants with wide and narrow vertical stripes, dark blue, green and gray possibly and a white top. Possibly Celtic looking but not an emotional type, very mathematically orientated. I was clinical then like a surgeon, trying to line up things exactly. Ahern stood in myself and thought of all he knew to activate the parts of the present brain he already knew were operating at full strength in his Atlantean brain. The purpose of this was to transfer his intelligence into my present brain, and he could measure the brain patterns to see if it ‘took’. Ahern also had technology to show the thoughtforms the brain produced while thinking. These could be captured by a machine and ‘read’. I then knew I had already taken tests on my present body before this, i.e. DNA and taken a piece of hair to maintain the link to the future. The tests were taken of my present brain pattern to make sure I had activated all the science sections. It appears some parts of the brain are easily activated, according to these scientists and others are dormant because ancestors didn’t use that section. Ahern gave myself new abilities that weren’t active. I will admit to being preoccupied with my own entertainment before I entered the pyramid in 1980, but after that I tried to turn to scientific information to understand the mechanics of life, which never drew my interest before. It took awhile, as I had a 6 year subscription to Science Digest and never read one! Finally my science sectors opened in my brain, the last 5 years. So having satisfied Ahern (my Atlantean self) that he had the right ancestors in place, he stood in me and thought of all the scientific knowledge he knew or invented. After scanning to see if those parts of the brain they used were active in the present me, he was satisfied that he could maintain a link to myself in future and feed information through as he wished, now the brain was made capable of receiving his technical data. What Ahern wanted to project through to the future, was how to clear the clogging on the earth’s gridlines and to get the planet’s biorhythms functioning properly. Also about how the other dimensions interact with this physical world in the atmosphere. My solution, as Ahern for the ails of this present time span was yet more science. The Atlanteans saw the electricity plants especially the nuclear ones disrupting the world’s biorhythms. Also the damming of the rivers created eddies in the gridlines. They relied heavily on the world’s gridlines for everything. So Ahern stepped out of myself and took another DNA reading after rearranging the ancestors to reflect what he wanted to transfer – he then applied a magnet to my spine where the kidneys are and made the kundalini shoot straight up out of my brow chakra, in such a torrent of light that it made the whole pyramid turn to glass before my eyes. He gave me etheric vision by causing the electric current of the spine to rise upward and go out of my optic nerves. After the chemical ether,(which holds time/moving-activities together) was removed and the Atlantean scene appeared, (leaving another form of ‘reality’ standing as a hologram) I then proceeded to change my future. 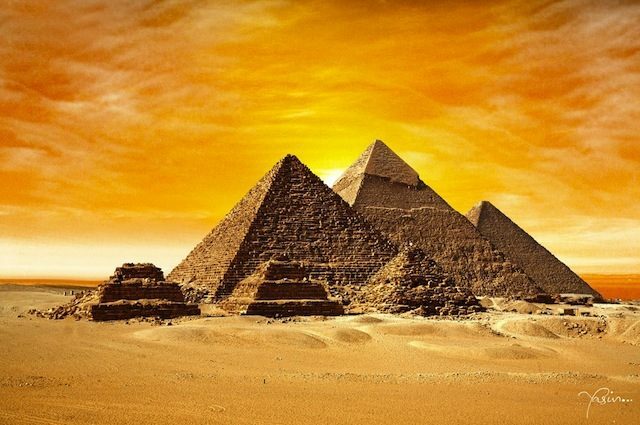 READ Where is the Capstone of the Great Pyramid? This reality was so tenuous that it can be manipulated by projecting colour. Red represents all that emotional energy which moves backwards to a single point to God’s heart. So if I wanted to speed back a hologram of a particular ‘piece of time’ I increased the red energy which made the hologram act as a film being wound back. I wound it to the events I wanted and then manipulated them. If I wanted to fast forward the hologram i.e. to the time I know I would go into the pyramid in the future I increased blue which makes the hologram speed up to show who would enter the Kings Chamber from the time it was opened again in future to let visitors in. When I entered in future, I seized the opportunity to make myself appear back to Atlantis ‘to enhance my abilities’. Blue moves things forward in time until all returns to God’s brain. Yellow also has an influence – as a drawing effect between the past and future. The different colours in between, in their finest shades select the events one wants changed. e.g. If one wanted to change only one event in the future they would see what vibration it was under and focus that colour into the scene. Each event in life is under the ‘rule’ of a different colour. This is how astrology works by having events under different vibrations. Other forces in the sky from the planet’s angles between themselves also trigger events. I’m not exactly sure how it operates, but yellow appears to be a connecting type of energy which acts as a link to potential events moving forwards as an outcome of the past towards those potential events passing backwards from the future as projections of hopes and future fears. It may possibly earth them, but I’m not as clear on its purpose. Yellow possibly strikes like lightning and hits two passing events and connects them. If you can imagine a DNA strand with two strands twisted together and the links between connecting certain bits forming a particular pattern – yellow acts as a bridge to make portions of the past jell with portions of the future. I believe that the events happening here physically are controlled by a form of etheric super computer, in the next dimension, which records and synthesizes the actions of the planet’s population and triggers events accordingly. The planets ‘control’ certain activities which happen on earth and unseen technicians refine the direction to target individuals. All individuals apparently have unseen ‘watchers’ who fit them into physical scenarios, which are firstly developed in the inner worlds at an unconscious level. Many different versions of one event are developed before people in 3D are placed in their positions like chesspieces. We ultimately have free will, but not in everything. Our character assets and deficiencies determine the road ahead. We have to know HOW the system of fate operates before we can get around it. We have to actively develop our good character before our destiny can change for the better. But we can also pray to get the path ahead cleared by Jesus, who will go through our problems with us on a subconscious level so that they are not reflections of character deficiencies. I think in Eternity in the realm above universal space beyond space and time–past, present and future exist simultaneously. But I think we can access the past and future easily in part from other worlds in-between, depending on what experience it is. Some things are still happening in another inner world simultaneously with this life. I believe that when we activate a particular part of the brain doing something, we ‘tune in’ to every other time we used it or will use it. It’s like a giant ‘superperson in the making’ of ourselves bypasses space and time and exists in the world of Virgin Spirit in Eternity. It seems like everything we do makes parts of it grow. In hindsight – I don’t think we should invent time machines with technology to try to change the past and future. Sometimes I think science only gets to a certain limit, then we go back to primitive times for our own safety. However in my case it has served its purpose, even if it made me turn to God to ask forgiveness to get rid of the very troubling deja vus caused by this and the next time machine described and to turn my DNA back. It taught me a lesson that it’s best to leave one’s DNA to God. My Atlantean self may have scientific ability, but I have much more will power so ultimately I control him–though he probably hadn’t thought of that. Though I had deja vus from two completely different time machines affecting me and it was intolerable, maybe it built up a bit of a fighting spirit and caused me to learn more deeply about the unconscious to fend them off. At least I felt how strong the past is in affecting us, just because it is supposedly history it can still affect us in another reality and be very powerful, depending on how much energy was used to project into now. Having a kind forgiving response from God about this was better than all the knowledge I’ve ever gained since Atlantis. I have decided to let my Atlantis scientific self have his say in the first person and real time and talk to various people who are interested in the mechanics of time travel and write a book for educational purposes to give an insight into the Atlantean mindset. I would ideally like to project back in time with willpower to before Ahern used the pyramid as a time changing device and stop him operating inside the pyramid so that my DNA didn’t get altered, but is this as bad as the original projection onto me? I don’t need a time machine to do it, as my will power is good enough (perhaps I have developed strength since the Flood through adversity) but where does one draw the line? I don’t know if that is also wrong to do, so need to weigh up my options and find out if the problem still remains in another form. I think the past and some of the future can be accessed mentally and this is possibly safer if it occurs in the World of Thought (on a need to know basis from automatic bleedthrough by present circumstances attracting it into the conscious memory) but I’m not so sure about hypnotists trying to force it. A local hypnotist here in Auckland got someone to go to the future and some extra-terrestrial that was there with the person in the future life, told the hypnotist not to make the man ask him questions about what was going on–apparently he knew what was happening.